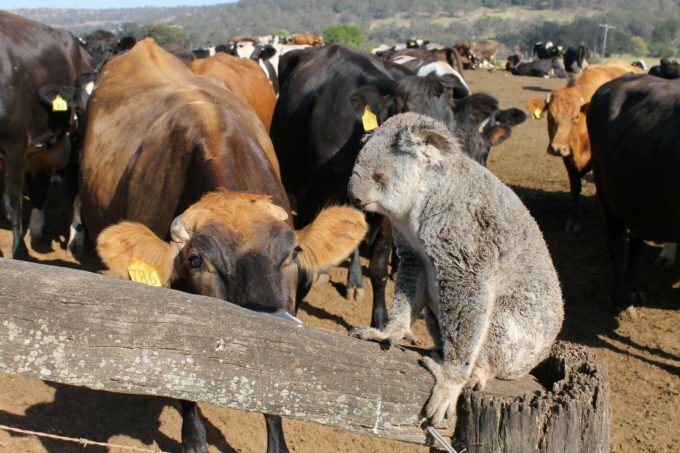 This koala was tossed and bitten by cattle while it was trying to cross the paddock in Southeast Queensland, October 2012. Sadly its injuries were so severe it had to be euthanised by a vet (Image Credit: WWF-Australia). CATTLE and horses are now attacking koalas who are forced onto the ground because of excessive tree clearing, WWF Australia reports. “Livestock attacks are one more obstacle faced by koalas when trees are bulldozed,” WWF-Australia conservation scientist Dr Martin Taylor said. “WWF is extremely concerned that largely because of the loss of their forest homes, koalas are on the path to localised extinctions in Queensland and New South Wales,” he said. Darling Downs koala rescuer Clare Gover says most people are unaware that cattle and horses can mistake koalas for a threat with horrific consequences. Clare tells of farmers who saw their cattle hurling a koala (shown insert) into the air like a rag doll. “The animal was drenched in cattle saliva after being bitten and tossed. Its injuries were so severe it had to be euthanised by a vet,” Clare said. In another case, a couple saw their two horses canter over to, and start pummelling, what they thought was their dog. To their astonishment it was a koala mother with a joey on her back. Clare’s rescue service Return to the Wild Inc. rushed the pair to the wildlife hospital. Rescuers called the mother Harriett and the baby Taylor. Harriet suffered a broken jaw and a fractured leg and Taylor’s leg was shattered. Both were operated on and spent 7 months in care before they could be released. Most koala deaths, when they are forced onto the ground by habitat destruction, are caused by vehicles and dogs. Clare is not out to demonise cattle and horses. She says if koalas had enough forest left they would not be forced to walk across paddocks searching for new habitat. In fact, she has compiled a dramatic photo album of koalas forced into unnatural places because their forest homes have been destroyed. “Present laws allow the destruction of trees at an unprecedented rate. Even small-scale clearing of road-side trees, or for housing estates, can have devastating consequences,” Clare said. “There is no point in protecting a species if you do not protect their habitat,” she said. WWF-Australia is encouraging people to create and send a digital origami koala, called a KIMBY (Koala in my back yard), to key Queensland politicians to encourage them to take action to stop excessive tree-clearing. So far more than 20,000 Koalas In My Backyards have been sent.